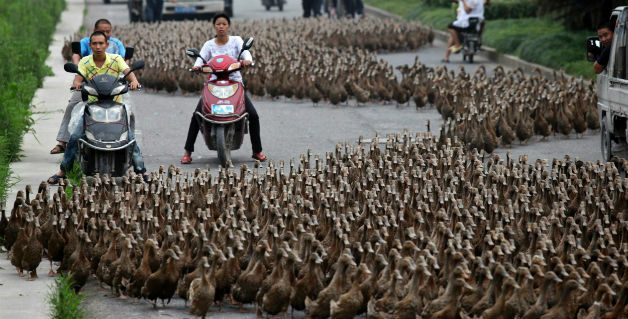 5000 Ducks Cause Epic Traffic Jam In China. All of us have been stuck in a traffic jam. But only a few of us have been stuck in a traffic jam caused by a waddling horde of 5,000 ducks. 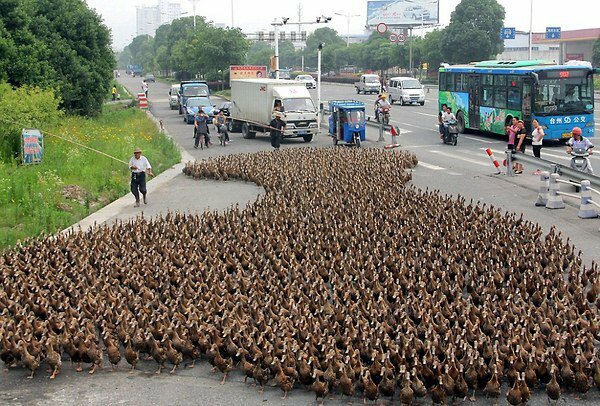 In chinese city of Taizhou,a farmer blocked a road with this 5,000 ducks when he relocated his enormous flock to a nearby pond, with help from only a long wooden pole and a couple of assistants. According to local media, the farmer boasted that he didn’t lose a single duck on the three-quarters-of-a-mile journey. Previous article Banana Can Cure Hangover. Next article 11 Facts About Human Hair And Nails That Everyone Should Know. 11 Facts About Human Hair And Nails That Everyone Should Know.